Press - What A Hoot! 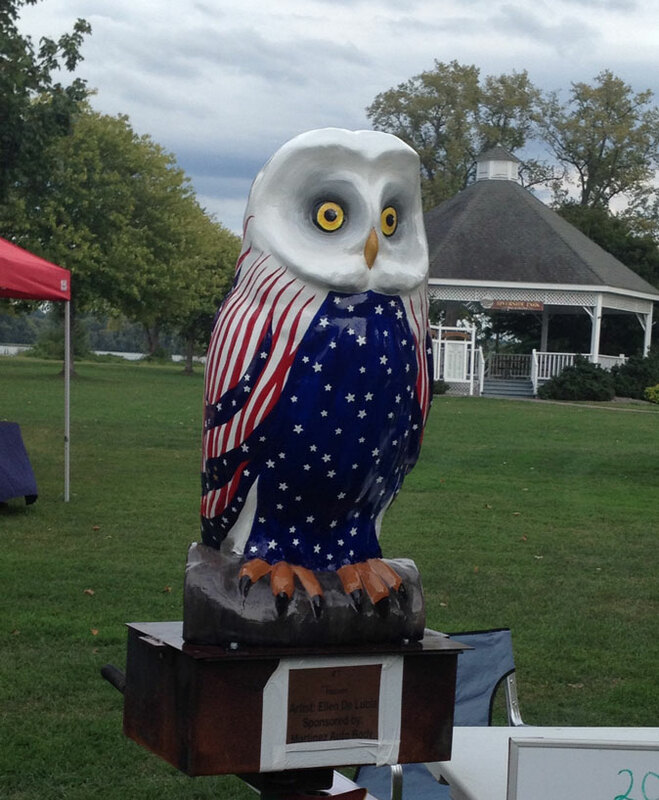 Public art exhibit: The owl “Freedom” was created by artist Ellen DeLucia and has been making the rounds in Coxsackie. Artists and would-be artists are being sought to design an owl of their own, which will eventually be auctioned off. No artistic experience is needed. COXSACKIE — Ever wanted to try your hand at crafting a creative masterpiece? This just might be your chance. 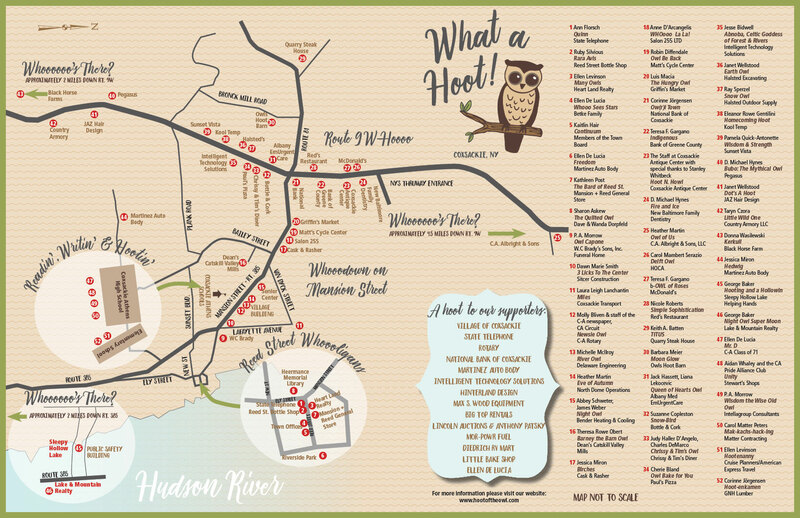 The Hoot of the Owl Committee in Coxsackie is looking for artists who want to put their personal touch on the streets of the community. 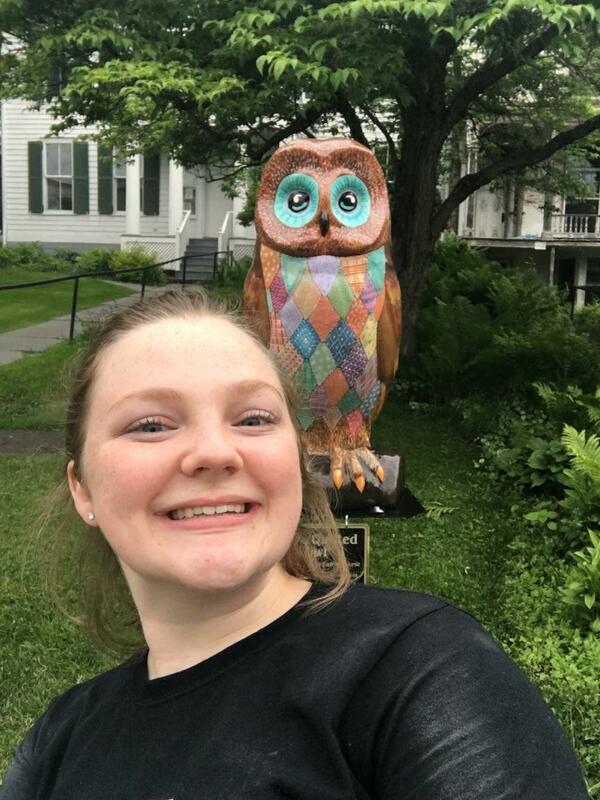 With 50 business sponsors already signed on and the owls on order, now the committee is looking for artists — whether those with experience or novices who want to give it a whirl — to design and decorate owl sculptures that will first be on exhibit in Coxsackie, and will later be auctioned off. Artists will get up to a 25 percent cut of the sale price of their piece. The project is the first of its kind in Coxsackie, but mirrors similar public art projects in neighboring communities like the cats of Catskill, the trains of Ravena and the bears of Cairo. One owl has already been completed and is making the rounds in Coxsackie — “Freedom,” created by professional artist Ellen DeLucia. DeLucia, who has crafted numerous cats for the Cat’n Around Catskill project over the years, created “Freedom” as a way of showing prospective artists what one of the owls could look like. She is also working closely with the Hoot of the Owl Committee to get the inaugural project off the ground. Artists are being sought to create owls, and you don’t need to have any experience, just a desire to get creative and let your imagination run wild. In fact, for many artists who have participated in the Catskill exhibit, it was their first foray into the artistic world. Artist Ellen De Lucia created the owl "Freedom" to give artists an idea of what a finished owl can look like. The Hoot of the Owl Committee is seeking dozens of artists who want to participate in the public art exhibit. COXSACKIE – Catskill has its cats, Cairo has bears, and Ravena had trains. Now, it’s Coxsackie’s turn. A volunteer committee has been working for several months to get a new project off the ground – Hoot of the Owl, a public art exhibit that will bring sculptures of creatively decorated owls to the community. Owls have long been the symbol of Coxsackie; indeed, some translations of the name “Coxsackie” – said to be of Native American extraction – are thought to reference owls, according to an article by Coxsackie Town Historian Michael Rausch on the town website. Committee members have been lining up sponsors – local businesses and individuals – who are willing to sponsor an individual owl at a cost of $500. More than 30 sponsors have already signed on, and as many as 40 could participate when all is said and done. Now, the group is looking for artists who would be willing to lend their talents and their creative eye to decorating an owl. Like the Catskill cats, once completed each owl will be posted at locations around the village for several months, and later auctioned off at an extravagant gala. Visitors to last week’s Coxsackie Farmers Market got a taste of what is possible in creating an owl when local artist Ellen De Lucia put on display an owl she created, just to get the creative juices flowing around town. De Lucia’s owl has a patriotic theme and has been dubbed “Freedom,” but the design ideas are limited only by the artist’s imagination.